Fit Fluential Mom: Campfire Pizza! Ok so this one isn't so "healthy" per say because we bought the premade Pillsbury pizza crust but it's deliscious and convenient and if you want to, you can make it healthy! This was my hubby's first shot at it when we went camping last and he wanted to do it "his" way. Next time, it'll be topped with tomato slices, parsley, roasted veggies and grilled chicken. THAT will be delicious so stay tuned. In the meantime, enjoy the "manly" version of Camping Pizza!! And yes, I indulged in a piece and counted as that 15% worth of treats I deserve and work hard for! Chicken, Portobello & Argentine Chorizo Pizza on the grill! Brush some olive oil on the grill after it's warm. Try to make the flame as low as possible. 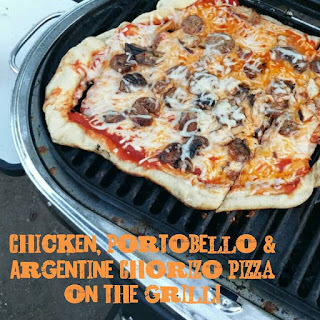 Spread the pizza crust on the grill, brush some olive oil on it and cook for a few minutes with the grill open Then spread the sauce on top, add the cheese and chorizo, chicken and portobello. Continue cooking at a low flame with the grill closed, checking it periodically and checking the bottom of the crust too. Once it's done, remove, slice and ENJOY! If you give it a shot, let me know how it goes and how you make it. Toppings for it are endless!! 21 Day Fix container count is 1 yellow (crust), 1 blue (cheese), 1 green (portobellos), 1 orange (olive oil), 1 red (chorizo & chicken) & count 1 purple (pizza sauce) since it's got sugar in it like a piece of fruit would. Now...this isn't an every day meal on the fix but NOTHING is excluded on it and can definitely be enjoyed as a treat!